Today I needed to make a thank you card and, inspired by one of the cards I created for the “Specialty Card Folds” eArticle, I decided to make it a Gate Fold card. Gate Fold cards are tri-fold variations where instead of folding the cardstock base to create three equal width panels, the two outer panels are each cut to half the width of the center panel. 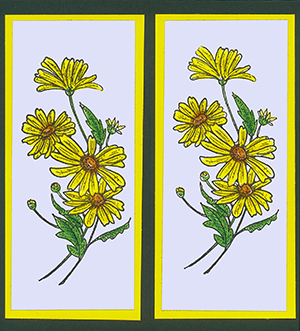 This way, when the card is closed, the two outer panels meet in the middle. They open like a gate, hence the name. The card’s intended recipient recently sent me a spring gift that involved a rabbit, so I wanted to include a rabbit in my thank you card. I liked a rabbit stamp I had, but it wasn’t really the right size to for the outside panels. 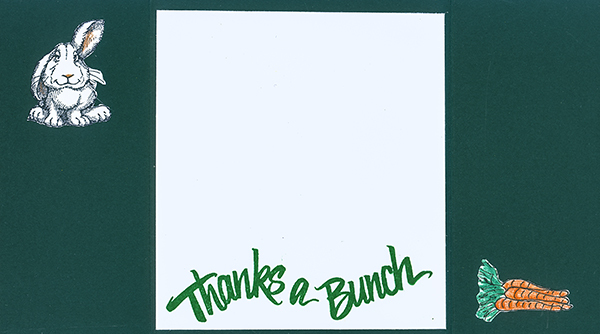 Then I saw the “Thanks A Bunch” text stamp when I was poking through my text stamps and realized it would be fun for a rabbit card. I didn’t have a stamp of a bunch of carrots, so I drew one with a Pitt Artist Pen. All the various pieces of this card (which measures 5 1/2″ tall by 5″ wide when closed and 5 1/2″ x 10″ when open) were attached using Xyron adhesive. The empty space above the text was used for a handwritten message. I went with some flowers on the front panels that I think my rabbit would enjoy. Isn’t it funny how you can have the same stamps for years and never think to use them together in a particular way just because you never had those specific requirements for a card?